Please come and support us at the Council meeting on Monday night (17th Oct). Once again, we need to pack the public gallery with residents as we enter the final stages of the ongoing battle we’re having with the council over the Croydon Local Plan (CLP) and the devastating effect it will have on our local area. We will again be making our objections to the Council, as this is our last chance to object to these policies, which if implemented, will have a serious and detrimental effect on Shirley over the coming years. If you haven’t yet put your objection in to the revised local plan, you can use our template: http://www.mo-ra.co/urgent-croydon-local-plan-clp-objection-letter-template/ (Note: Objections must be received by the council before midnight 17th Oct 2016). We’re not done yet and neither is the Council, if they get away with this then they’ll be back for more of our green spaces, back gardens and will knock down more houses to put blocks of flats in their place. We will be meeting outside the Council Chamber at 6pm. 6.00pm: Meet outside council chamber. The Croydon Debate is Agenda item 7. We need your help! We are in the last stages of ongoing battle we are having with the council over the Croydon Local Plan (CLP) and the devastating effect it will have on our local area. Thanks to your support and the huge number of objections that were lodged over the first draft of the plan had a significant effect and several planned changes and developments were dropped as a result. This is our last chance to object to these policies, which if implemented, will have a serious and detrimental effect on Shirley over the coming years. The plan is not positively prepared. The plan is not justified. The plan is not effective. The plan is not consistent with national policy. Do you want to wake up and look out of your window at a block of flats? I guess not. That’s why we need you to attend the Council meeting on Monday 18 July 2016 at Croydon Town Hall. This is our last chance to show the Council we still want changes to the plans before they are agreed and sent to the planning inspectorate. So please make time to attend. The Croydon Local Plan will determine the amount new houses and flats that are to be built in Shirley over the next 20 years, once approved there’s no turning back. But we know this isn’t true. The council’s original plans for Shirley included plans to replace our homes with blocks of flats and build on our green spaces. Had we not got together as a community with a single voice, they would have concreted over where we live. And while people power has had a major impact, we need to keep up the fight. The area for intensification is still too large and we are demanding the Council reduce it even further. There are still too many residential roads that will face planning blight as developers knock down our houses and replace them with blocks of flats. The plans are wholly unacceptable – they are not fit for purpose will gradually change the face of the area. We demand the Council scrap the intensification plans for Shirley. Come and join us. We will be meeting outside the Council Chamber at 6pm, and will be letting Croydon Councillors know exactly what we think about their plans. We will have 30 minutes to ask questions. Public Questions (30 minutes) is Agenda item 7 (Items 1-4 are procedural items). Due to your support of the Save Shirley campaign we’ve had some success with the Council’s Local Pan. The area of intensification has been reduced with Ridgemount and Wickham Avenue taken out of the plans. The two sites identified as suitable for Gypsy Traveller sites have been reclassified. The old nursery will be used for growing fruit and vegetables and Coombe Farm designated as housing. Which is great news and shows that when residents come together with a single voice we can change things. However, it’s not all-good news. The Council is still intent on designating the Metropolitan Open Land around Shirley Oaks, allowing back garden developments and building blocks of flats in parts of Shirley. We’ve already seen the start of this with recent planning applications approved in Orchard Avenue, Orchard Way, Wickham Road and the houses and flats that are going up in Gladeside. The plans are due to get signed off at the Council Cabinet meeting on Monday 11 July. So, we need to be out in force and then again on Monday 18 July when the signed off plans are presented to the full council meeting. Now we need your support again. We need hundreds of you to fill the meeting and get vocal about our local area. Come and join us. We will be meeting outside the Council Chamber at 6pm, and will be letting Croydon Councillors know exactly what we think about their plans. So, please bring friends, families, neighbours and banners. But most importantly bring yourselves and your voices. We need to be heard. 6.30pm: Cabinet Meeting starts. Croydon Local Plan is Agenda item 7 (Items 1-5 are procedural items). We can leave the meeting once Agenda item 7 is concluded, but you can stay on to the end if you wish. Below are the key changes to the Croydon Local Plan and the new map of the areas identified for intensification. Reduction of Areas of focussed intensification proposed around Shirley Road Shopping Parade and Shirley Local Centre (Policy DM35). We had a great turnout for our 92nd AGM last Wednesday at Edenham High School, which was a new venue for us. Thank you to all our members who attended and contributed to the lively debate at the end on issues that are facing us in Shirley. We’ve had some great feedback already and really glad you enjoyed the presentation of updates from MORA. For those of you that missed it, there are some pictures below, and we’ll be publishing more details in our Summer Magazine. Don’t miss it. 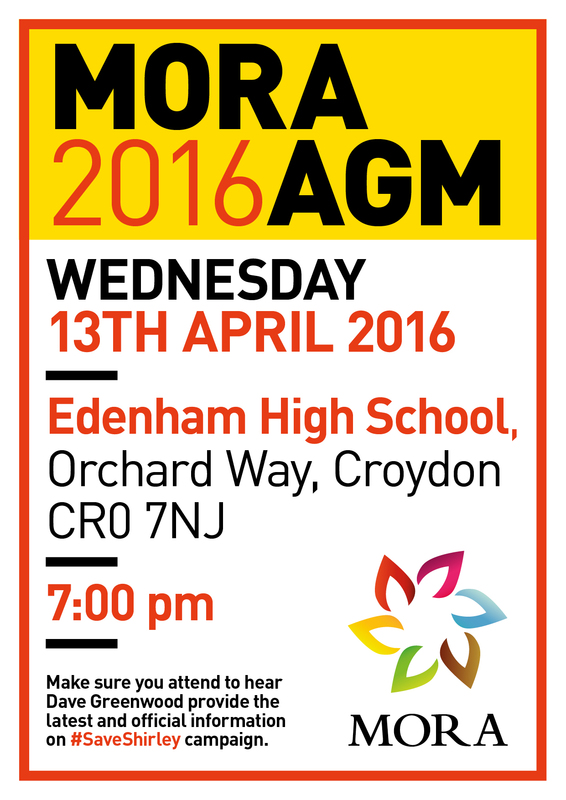 Please come along to the MORA 2016 at Edenham High School on Wednesday 13th April 2016 from 7pm. Invitations have been sent to: Gavin Barwell MP (Croydon Central), Steve O’Connell – GLA Member, Shirley and Ashburton Ward Councillors, the Shirley Safer Neighbourhood Police Team and representatives from the Health Service, Fire Brigade and local businesses plus all local Schools. We are committed to keep up the pressure on the decision makers who can influence what’s going on in our area. That includes Boris Johnson and mayoral candidates Zac Goldsmith and Sadiq Khan. Following an invitation to visit the area and see for himself the devastating effect the Croydon Local Plan will have on Shirley, Zac put his money where his mouth is and attended a meeting with Save Shirley campaigners. Zac’s visit to Shirley was reported in the Croydon Advertiser. If you missed it click here to read the full story. Zac Goldsmith, the Conservative candidate for London Mayor returned to Croydon for a general meeting this week with residents from across the borough organised by Gavin Barwell MP. Zac addressed residents for 10 minutes and then opened the floor for questions. During the lively debate, Zac confirmed his promise to the Save Shirley and MORA that if elected in May he will protect London’s green belt. We recently attended Boris Johnson’s People’s Question Time when it came to Croydon Fairfield Halls on Thursday 3 March 2016. The all ticket event, held twice a year, gives Londoners the chance to quiz the mayor and London Assembly members on topics including housing, transport and community safety. In his response, The Mayor of London said although it is a Croydon Council matter he “will very much disagree” with their plans to build on Croydon’s green spaces. Steve O’Connell, our Assembly Member, chaired the event. Tell us the intensification of Shirley isn’t politically motivated. On Thursday night six councillors voted to allow a detached residential home be demolished and in it’s place a high-rise block of flats. However, we believe the Planning Committee did not judge the application on current planning policies, but on a prejudiced and vindictive rebellion against the Shirley Residents and a further assault on the character of the area. We believed this is a direct response to the ‘Save Shirley’ campaign and our objection to the proposed Croydon Plan CLP2. This application was not determined upon the current Planning Policies. It’s out of character with the area and shows a total disregard for the character of the area and surrounding properties in Shirley. Worryingly, this will now set a precedent for the destruction of Shirley. All six councillors are Labour. Their details are below. we urge you to email them to demonstrate how disappointed we are that the people in charge of Croydon’s planning applications make their decisions based on political point scoring. We object to the Planning Committee voting in favour of granting outline planning permission for 40 Orchard Avenue in Shirley. We believe the Planning Committee did not judge the application on current planning policies, but on a prejudiced and vindictive rebellion against the Shirley Residents and the character of the area. This application was not determined upon the current planning policies. It’s out of character with the area and shows a total disregard for the surrounding properties in Shirley. We ask you to reconsider the application based on current planning policies adopted by the Planning Inspectorate. Save Shirley is a non-political campaign created by residents and MORA (Monks Orchard Residents’ Association). It’s backed by seven Shirley residents’ associations to oppose this current administrations politically motivated plan to wreck our residential neighbourhood. We would like to thank MORA member Lianne for speaking against the proposal at the planning meeting. Also to the Shirley residents that filled out the Public Gallery. You made sure our united voice of objection was heard. Thank you for your continued support.